The Siege is a translation to the n-th degree. Written in Albanian in 1970, translated into French in 1994, and from the French into English in 2008. It’s like a game of telephone and I can’t help wondering how much was changed with each retelling. Is the book that won the first Man Booker International Prize still the same book that the author intended it to be? 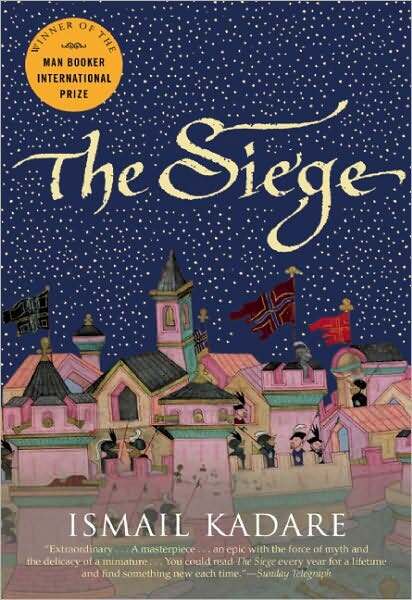 Doubts aside, The Siege by Ismail Kadare is wonderful. It describes a fictitious, 15th century siege of an Albanian fortress by the Ottoman army. The novel follows members of the army- smoothly transitioning from one character to another. We see into the minds of the campaign’s Chronicler, the Astrologer, the Quartermaster, the Pasha (who leads the army) and his harem. The fates of a cast of secondary characters are described as well, as they emerge from and return to the legions of nameless men. The author pieces all of these descriptions together into a narrative that reads more like a historical account than a heroic epic. The prose is straightforward and un-embellished, the story focusing on logistics rather than battles. Tunneling, artillery, supply lines and siege tactics are shown preference over scenes of battle (though we are given some of that as well). The overall feel is of being embedded in with the troops. Intermittently, Kadare changes the perspective from which he tells his story. The besieged Albanians speak in the collective voice, taking on the haunting quality of a Greek chorus. It’s a powerful device, emphasizing the cultural distance between the Albanians and the Ottomans, and squarely placing our sympathies with the former. In the Albanian segments the account of events is given in the first person, whereas the Ottoman side of the story is told through an omniscient narrator. After long passages of observing activities on the ground, the same events are described as they are seen and interpreted from the height of the fortress’s walls. At the first beat of their drums, the sight that greeted our eyes was unbearable. Such madness we had never imagined – neither in the orgies of ancient times, whose memory has come down to us through the generations, nor in the wildest carnival nights in our own villages. Shouting, screaming, praying and dancing, men offered themselves up for sacrifice, made exhibitions of themselves which, as we were to learn later on, severed heads carried on talking as if still in delirium; soldiers wailed as if they were night owls and banged their drums dementedly. All those noises wafted up to our castle like stinking vapors. Kadare does this 360-degree style of narrative well. The novel carries a sense of movement. The reader physically explores the camp, wanders from section to section, into tents, down tunnels, up onto the walls and then back down again. There are defined geographical parameters. (For example, you do not follow the akinxhis, or raiders, out of the camp and into the countryside. Instead you watch them leave and listen to their news when they return, which in many ways is better). But within the story’s borders there is a sense of space and layout. Kadare created an universe in a bubble. In my experience, this isn’t an easy feat for an author to pull off – the total immersion into a period and a way of life that no longer exists. There is some action in The Siege, but not a lot by film standards. There’s even less suspense, and absolutely no glory. The overall pacing is slow. But there was never a point where I was bored or wanted to put the book aside. Quite the opposite. I’m happy to say that a quick look-up on Amazon showed a whole slew of Ismail Kadare books available in translation. Next postSherlock Holmes At Large! Hello again, BSB, I read this one too, and really enjoyed your thoughts about it. I especially like the way you’ve analyzed the narrative techniques.